Rapid Redux now shares the modern era record of 19 consecutive wins with Peppers Pride and Zenyatta. Rapid Redux took 10 months and 25 days to win 19 in a row. Zenyatta needed 2 years, 11 months, and 10 days to get to 19 victories. Peppers Pride reached the 19 wins in 3 years, 4 months, and 29 days. Of Zenyatta’s 19 victories 17 came in grade one or grade two stakes and she earned $7,304,580 in her career. Peppers Pride won 14 New Mexico-bred stakes races and $1,066,085. Rapid Redux ran in the Tyro at Monmouth Park as a two year-old and the Long Brach at three and he finished last in both. He has career earnings of $332,544. Here are some interesting facts from the 19 races in Rapid Redux’s streak. •Rapid Redux was the favorite in 16 out of 19 races. In the past 13 he was under even money with the highest being .60-1. In his first victory in the steak the odds were 5.20-1. •The closest win margin was by a nose at Penn National on 29Mar11 giving him victory number 8. •The largest win margin was 10.75 lengths at Mountaineer 6May 11 on a good sealed track for his 11th win. 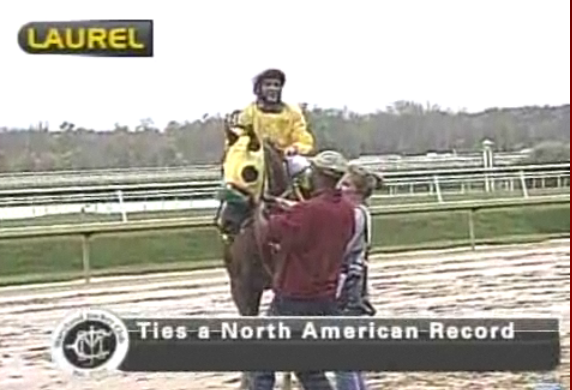 •His highest Beyer Speed Figure of 92 occurred at Charles Town in an Alw28000N1M run 20Jan11 for win number 4. •The lowest BSF of 67 happened at Thistledown in an Alw5000s on 15Jly11 during win number 15. •His 19 starts have happened at seven different tracks: five at Penn National, three at Mountaineer, four at Charles Town, four at Laurel, one at Parx, one at Thistledown, and one at Timonium. •Rapid Redux has won at seven different distances: once at five furlongs, twice going six panels, three times at seven furlongs, four wins happened at a flat mile, one at a mile and 70 yards, four running a mile and a sixteenth, and four at 9 furlongs. •In his last 14 races Rapid Redux was only behind once when he was third by a neck at the first call at Thistledown on 15Jul11. •Rapid Redux has had 4 different trainers: Kelly Breen (4 wins), David Geist (1 win), Kevin Fields (0 wins), and David Wells (20 wins). This entry was posted in Rapid Redux. Bookmark the permalink.